"I'm no chuk..."- damn skippy, Matt- you're better! Nice recovery from the heartache of shrunken resin. You can see a doctor about that now, you know. I'm here all week, folks! Ladies and gentlemen, the master AND Court Jester speaks! Thanks Chu[c]k. I'm going to put as much time in as I can over the next several days, see if I can't get these things into once piece. Mal has made masks for the marking that I want for the Rufe, I'm really excited. Float fighters are so cool, I'd love to see what a Super Hornet would look like on floats. this is all very impressive. It almost looks real. Matt, I'm sure you will come up with good solid solutions for getting the part pinned and aligned properly given what you have done so far. I have no clue off the top of my head how to build one, but I am sure a simple jig for aligning the parts would be fairly easy to come up with. Hey guys, the tails of both aircraft are assemnbled. and the wing for the Rufe has been modified. I just wanted to give a BIG shoutout to Mal Mayfiend of Mirical Masks. I meant to message him way earlier in order to have the paint masks ready ahead of time. Mal rushed into my order and they arrived yesterday looking as beautiful as the last set I used from him. I'm excited to use them again. He even typed up a page full of directions just for me for a rather complex tail mask. And Chuck, you did a beautiful work on all of his artwork. Sorry for the delay folks, I don't even really know where the time went. Filling, sanding and scribing have been my modelling life for the past few months. 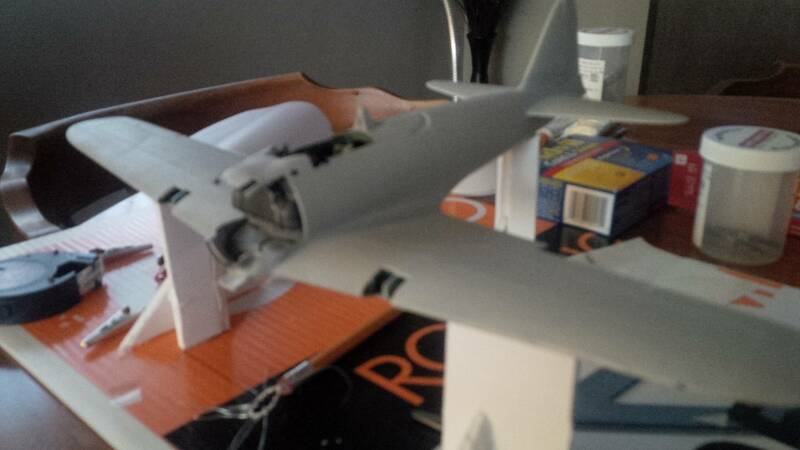 Surprisingly the wing on the OOB A6M5 was a MUCH more difficult fit than the converted A6M2N. It was a clear reminder that these were the first of the Tamiya 32nd Super Kits and aren't up to the same standard as the spectacular P-51 that I recently built. Not really too much in the way of a pictoral update, but this is a massive step forward. My hands are still shaking from finally get the center float on and aligned. The foam blocks are actually tire dressing applicators. I can slide them in or out on either side to change the attitude of the wings by mere degrees. An additional one of the rear for the longitude. The foam jig holds the float still. 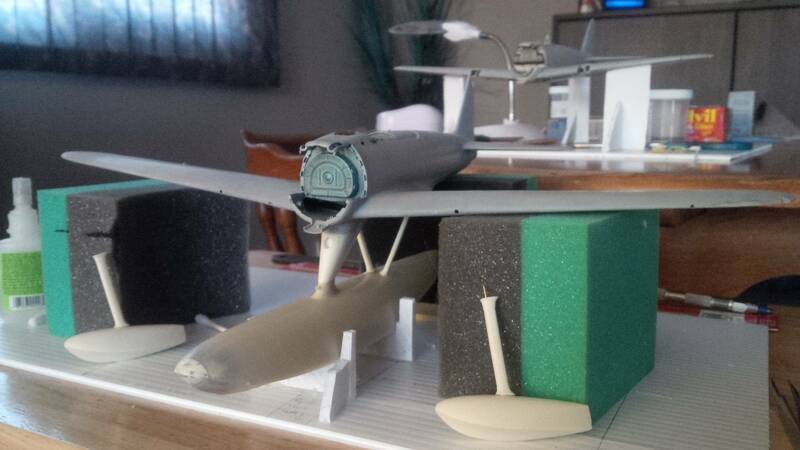 As you can see the wingtip floats are ready to be installed, I'm just fighting with myself over whether or not to install them before painting or after. Pinning these all together was probably the hardest thing I have ever done modelling wise. Well worth all of the effort Matt, it's looking great at this stage! Great to see you back! I can understand how you feel after attaching the float. Adding large pieces that don't lock into place yet require perfect alignment always put me into a nervous state. The parts didn't have any locating pins and the measurements from the instructions didn't work (as I learned from someone elses build thread) IT would have been easiest to align and assemble it upside down, but the secondary struts simply don't have any load bearing strength. Glad to see that you're back among us. I was wondering where you've been. Then again, lately I'm no one to talk as I just haven't been able to spend much time at the bench. Partly work, partly family, and partly a real bad case of spring fever that I haven't had in many years. Sure looks like you've made a lot of progress with the center float. As usual, your home made jigs are simple, yet so effective. 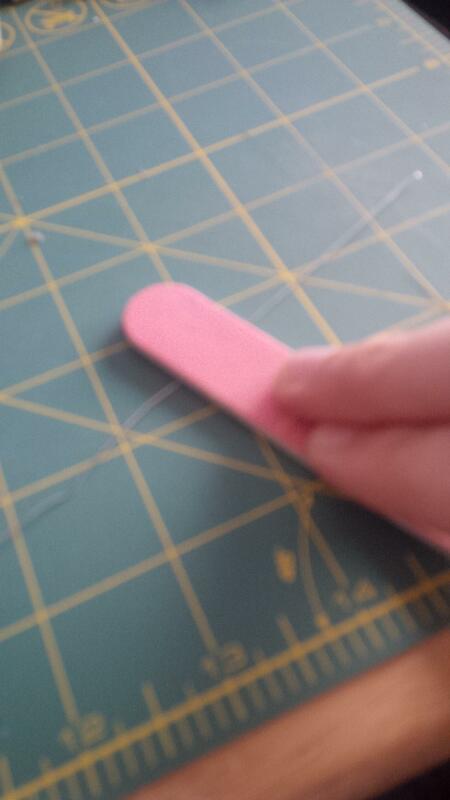 That's often the trick - in fact that's the only trick - having the parts line up at the instant the glue dries. This is the same regardless of part size or weight. 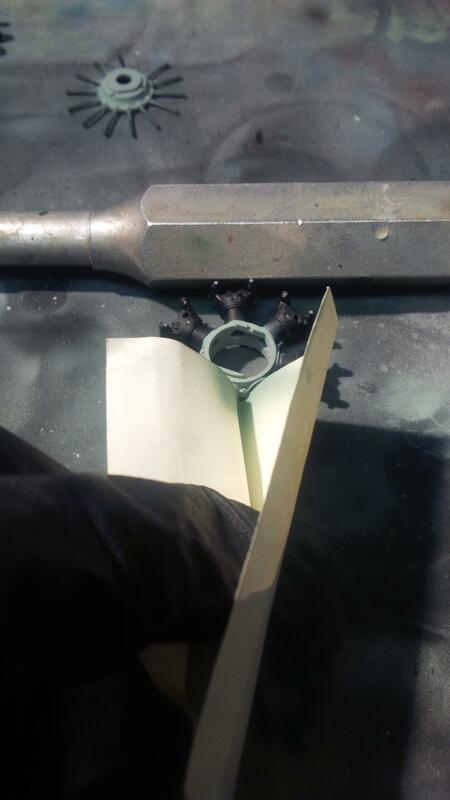 Often when working with a part that has to be glued edge to a face, I'll apply the glue to the edge and find a way to leave it propped up/open and walk away while the glue dries. I've been filling the seams on the main float and painting the engines. Time to add paint next week. Just a quick dry fit. No weathering done yet, but I am going to paint the engine exactly as per the AK Interactive Aircraft FAQ - trying some new techniques. This is the Sakae type 21 radial from the A6M5. The A6M2N uses the earlier engine, which is similar but uses a different crankcase and accessory section. There are approximately 20 parts here already. 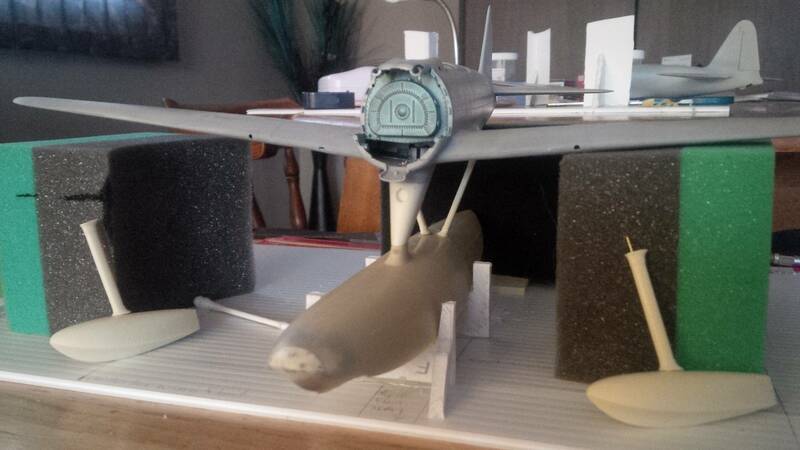 Both airframes are primed. I'm deciding exactly how I want to do the weathering for each one. I will be using techniques from the Encyclopedia of Aircraft volume 4 Weathering as part of my review of this fantastic book. That's a great looking powerplant! I like that you can actually see air between the push-rods and cylinder walls. I cannot take too much credit for it - it's all Tamiya's hard work. The whole kit is very well engineered. Now I get to just hope and pray that the conversion to the Rufe doesn't interfere with the engine fitment. I'll 2nd what Gray said. that engine really looks incredible in 1/32 scale. Wait for wiring and proper painting/weathering. 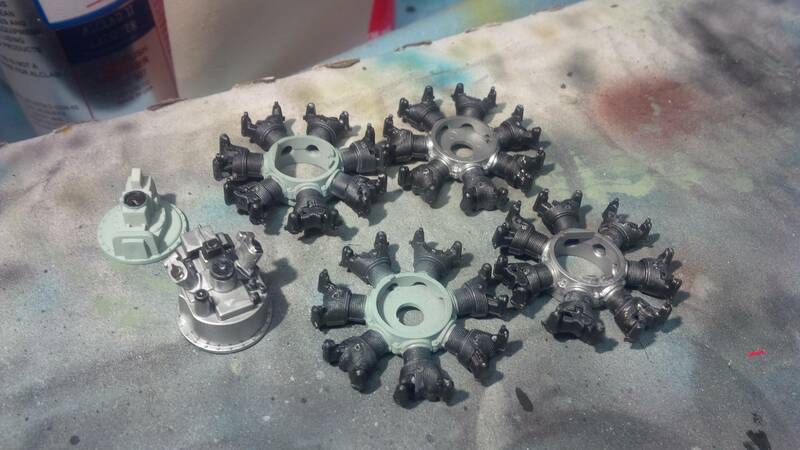 I never paint my cylinder heads black - I always paint them silver and then do a wash with Tamiya Smoke. This is making me nervous following the FAQ lol. A medium gray drybrush coming right up. 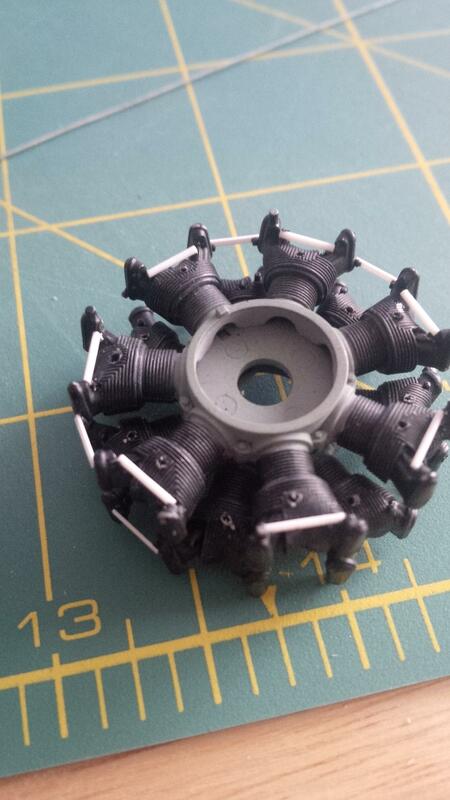 I do the same with any cylinder heads, but use a heavier wash of Model Master Flat Black. I would have thought that the Tamiya Smoke wouldn't have given that deep of a finish. I just may try it. I would have thought that the Tamiya Smoke wouldn't have given that deep of a finish. I just may try it. Try it - it's my go-to for almost any wash. The depth depends on the amount that you thin it and the number of applications. The thinner it is the more it looks like an oil or a grease. I typically find black washes to be too stark. Hey guys. Just another quick update. 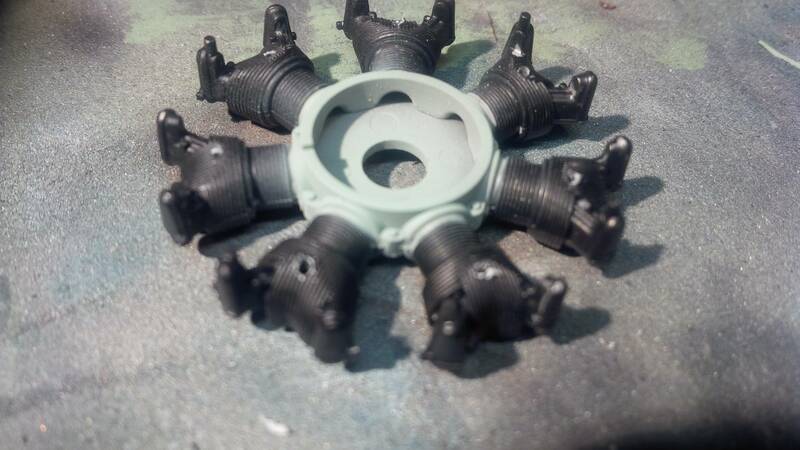 So I discovered - much to my horror - that I had made an oversight when painting the engine for the A6M2N. The entire crankcase is actually a (very odd colour) and not a neutral gray like I thought. The casing on the A6M5 is metallic from front to back except the gearbox. This was only a problem because I had already painted all of the cylinders black - and as you know, I'll do just about anything to avoid brush painting. And so now we have another lesson in fast-masking. I needed to paint between all of the cylinders, but without getting any overspray on the cylinders. Aha - again, a post-it note saves the day! I folded the note in half and I can control the spread of the far end with my finger. I sprayed both rows of the engine in minutes and don't have to repaint anything. The (rather large) xacto handle simply stops the engine from moving away or rotating. I airbrushed on a downward angle to avoid getting paint on the far cylinders. 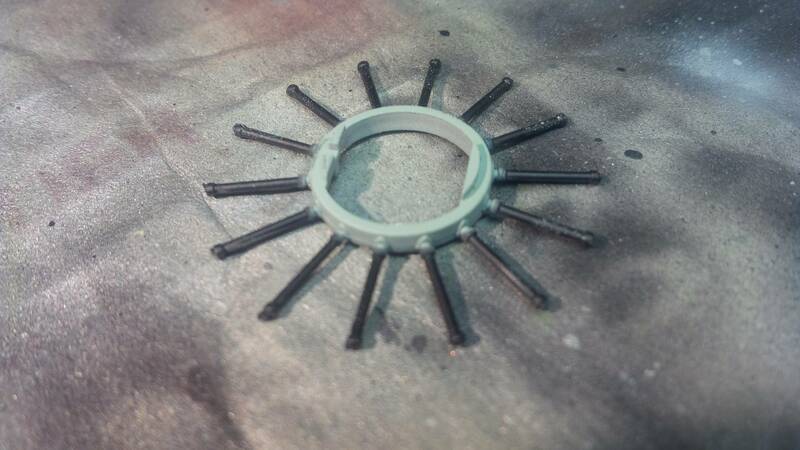 For the pushrods, I used a circle template - I use these often, the paint comes off them with water or windex if you use acrylic (and if you care enough to clean them back up). Great work Matt, this is coming along beautifully. both engines really look quite nice at this stage. I must confess that one engine casing is painted which makes sense since these aircraft will be taking quite a beating from ocean spray and the salt air over their respective life spans. Which is why the decision to leave the other crankcase NF doesn't make much sense. Here's a quick tip with a crummy pic. 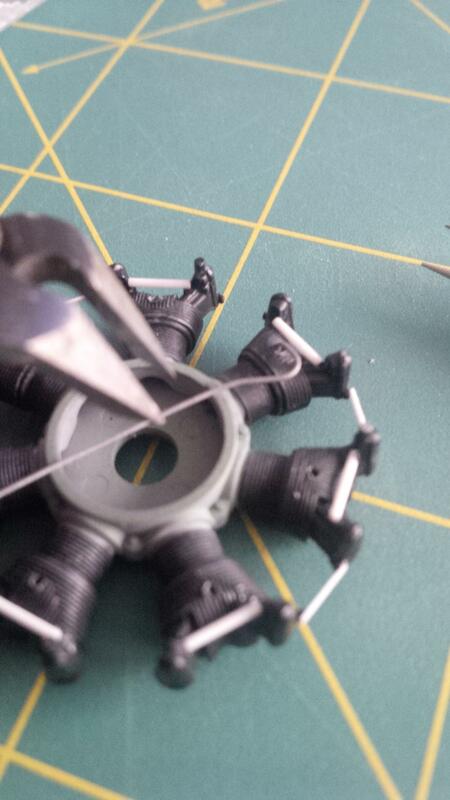 Most sources for small wire leave you with a wire that's been curled or bent etc. It's always best to scratch something from wire that's straight to begin with. 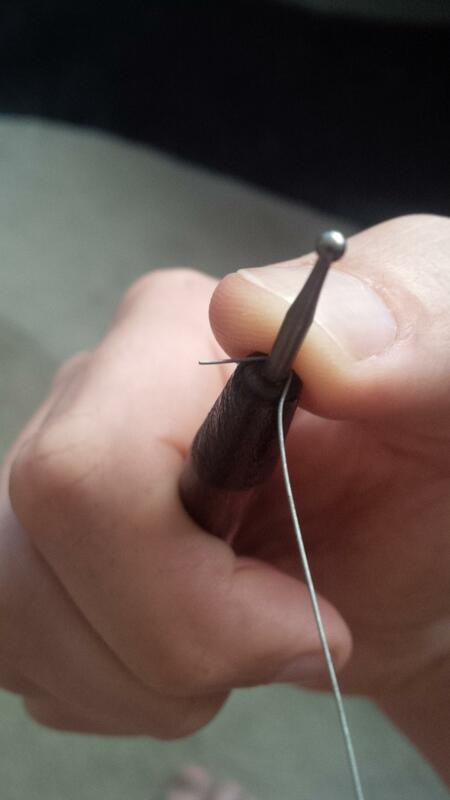 Here's a painfully easy way to get that wire completely straight. 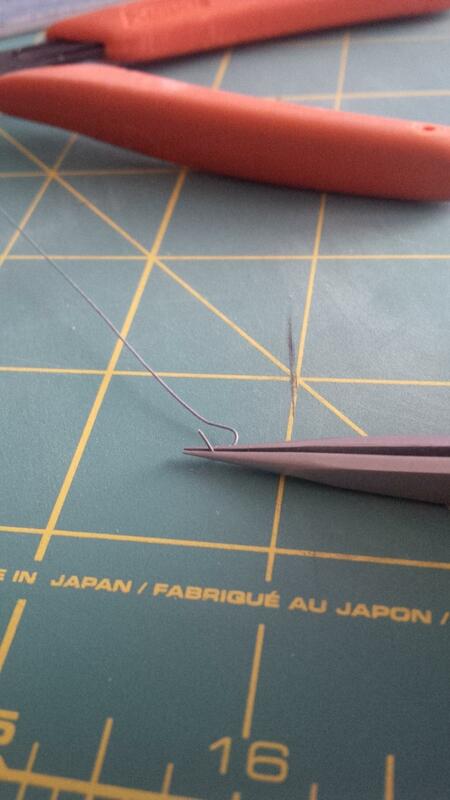 Put the wire on your work surface; a cutting mat works best because it offers some friction. now roll the wire back and forth - I use a sanding stick because the grit makes the wire roll. Roll it back and forth over the wire and down the length. Et voila! It helps to have the wire straight-ish before you start - pull both ends. I'm sorry the photo is out of focus, I was running out of hands. You an see that the end to the right has been straightened. Here's one of the engines - the balance tubes are now in place (round styrene) as are the stiffeners for the cylinder heads (flat styrene). These need to be painted, but first I'm going to make up a single pair of ignition wires to be used as a template for the other million. Making up the ignition wiring. The reference photos I'm using are from the NASM's Gekko (as it uses the same engine). The drawings - even in the Aero Detail book! - are hard to decipher as far as where the wiring goes. Basically as far as I can tell, in front of each pushrod, there are a pair of wires - one in the shape of a ? and another one that is bundled to it. The question mark shaped wire goes to the spark plug on the front cylinder, the other wire runs over the head of the front cylinder and terminates at the spark plug of the rear cylinder. For me - the trick with wires like this, is that they should all look about the same, but I don't want them to be identical. For this reason I don't use a jig or a template, but I bend each one by hand. Much like painting - I straighten the wire (as above) because I want to start off with the base for each part being the same. (in painting, either primer or plain plastic, so the underlying colour effects the overlying paint the same way - if that makes sense). I take the straight wire, and bend the cure of the wire around something with the radius I want - drill bits are great for this! Now I can use this tool for each of the 14 wires I have to make up (two engines) keeping the radius of the curve about the same. Note that to the left of my thumb (left in the photo) I have left a straight portion, which I will bend 90 degrees to insert into the head. Then I insert the wire into the hole I drilled out where the spark plug was molded on. I can change the general look of the wire by holding that end in the cylinder head and pulling the other end towards the center of the engine. Keeping in mind this wire is still part of the section that I straightened out (6" or so). I cut the excess off using sprue cutters, leaving a little extra so that once the engine is entirely assembled I have some room to play. New on board and just finished reading through your build thread. Some very impressive work and weathering and mastering the center float was a wonderful piece of engineering. I'm a large scale builder and fully appreciate all the detail work and small touches to this point.